The industrial RO plant is engineered as per the client's technical specifications and in accordance to the standards & requirements of the particular industry it will serve. This commercial RO system is ideal for different types of industrial setups that required treated water. The industrial RO system is not only highly effective but also easily maintainable. These can be cleaned with ease and operated continually. These systems are cost effective and reliable. Industrial reverse osmosis RO system removes up to 99.9% of salts and contaminates from different impure feed water including municipal, brackish and surface water. It blocks bacteria, particles, sugars, proteins, dyes, and impurities that encompass a molecular weight of more than 150-250 Dalton. 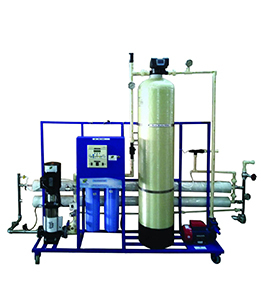 industrial reverse osmosis RO. Pure Aqua builds a wide range of pre-engineered and custom industrial reverse osmosis systems, range in size from 28,000 to 1,000,000 GPD to meet every industrial water treatment need and application. 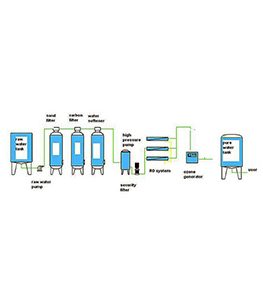 These energy efficient industrial RO units produce high-quality water at a very low cost. This RO-400 Series tap and brackish water equipment is equipped with media filters, chemical dosing systems (pre chlorination, antiscalant, dechlorination, post chlorination and post pH). This equipment is primarily customized to suit individual customer and water application needs. 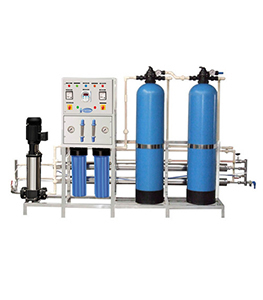 The RO-400 Series is recognized as one of the most compact industrial reverse osmosis equipment on the market, built with state of the art energy saving membranes. The design of the RO-400 Series skid mounted industrial reverse osmosis system, takes into consideration certain matters such as robust construction, user friendly design, environmentally friendly material, and long-term reliability. We also offer fully containerized/mobile RO water treatment systems that are assembled inside of an ISO standard shipping container. Each container is customized for each individual water treatment application making it easy to install and operate with high efficiency, a compact foot print, and energy saving features. 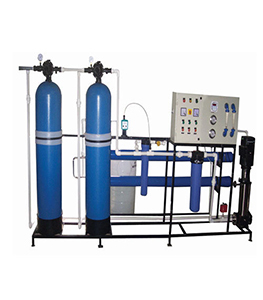 Industrial reverse osmosis plant includes multimedia prefilter, water softener or antiscalant dosing system, dechlorination dosing system, reverse osmosis unit with semi-permeable membranes, and UV sterilizer or post chlorination as a post treatment. These machines apply the technology of reverse osmosis by transporting feed water through multimedia prefilter to remove particles that are larger than 10-micron. Then the water is injected by an antiscalant chemical to control hardness fouling that may cause damage to the membranes within the machine. These pretreatment options have the capability of removing hardness, chlorine, odors, color, iron, and sulfur. 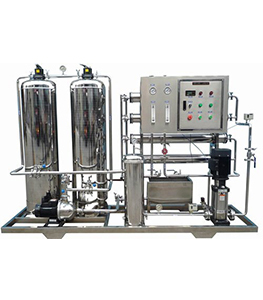 The water then continues into the reverse osmosis unit where a high-pressure pump applies extreme pressure to the highly concentrated solution, separating the remaining salts, minerals, and impurities that the pre-filter cannot catch. Fresh, potable water comes out from the low-pressure end of the membrane while salts, minerals, and other impurities are discharged into a drain on the other end. Lastly, the water is passed through a UV sterilizer (or post chlorination) to kill any bacteria and microbes that still exist in the water.